This gets complicated. This 45 rpm three-EP set on the Variety label--18 Big Rock 'n Roll Hits--was also issued (earlier, I'm assuming) as a 12-inch LP on the mega-cheap Hollywood label. 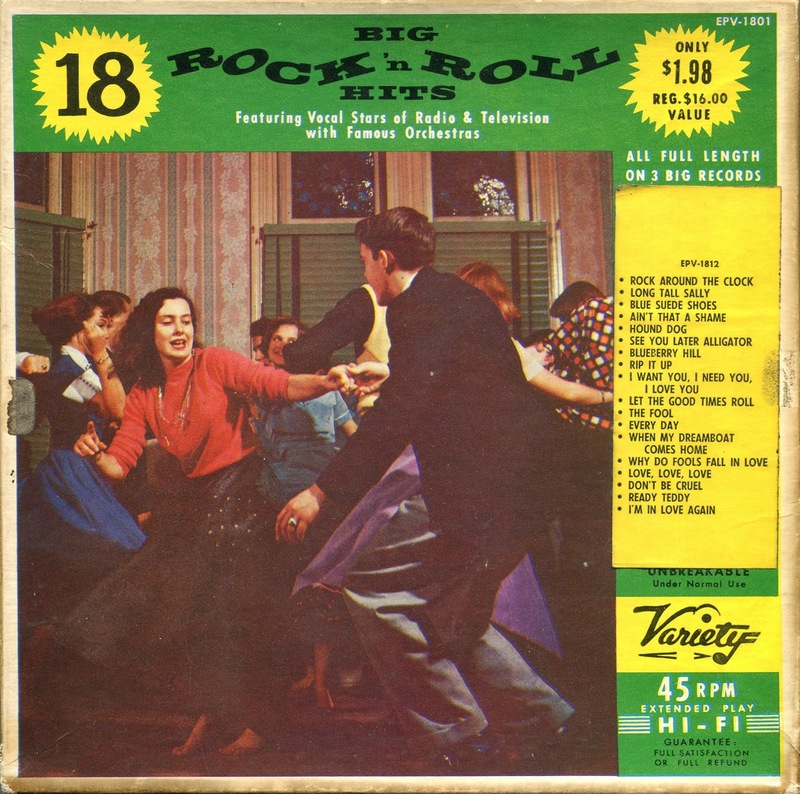 That Hollywood LP was a reissue of an earlier Hollywood LP from 1957 called The Nation's Favorite Rock 'N Roll Hits. My copy of the Hollywood LP (the reissue) is worn to death, so I'm using this set. Well, I guess that wasn't too complicated. 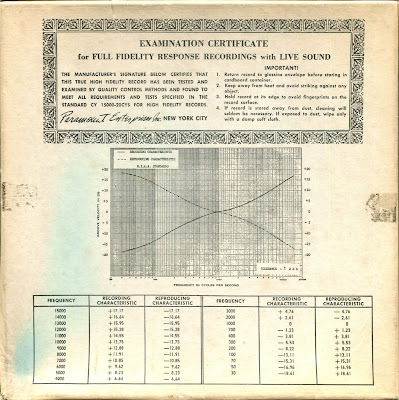 Sound quality, predictably, is awful, making the above "Examination Certificate for Full Fidelity Response Recordings with Live Sound" (back cover of box) especially hilarious, since these have about a 9,000 Hz high end. I doubt they top off at 15000 Hz, as claimed. I got these to sound acceptable, and, in the process of ripping the final disc, I discovered that my Stanton 680 HiFi cartridge navigates warped vinyl effortlessly, in contrast to my 500 cart, which wants to bounce. For lowest-quality EPs, these restored pretty well (with a good amount of de-clicking). The performances are better than we have a right to expect, and some are even genuinely good. 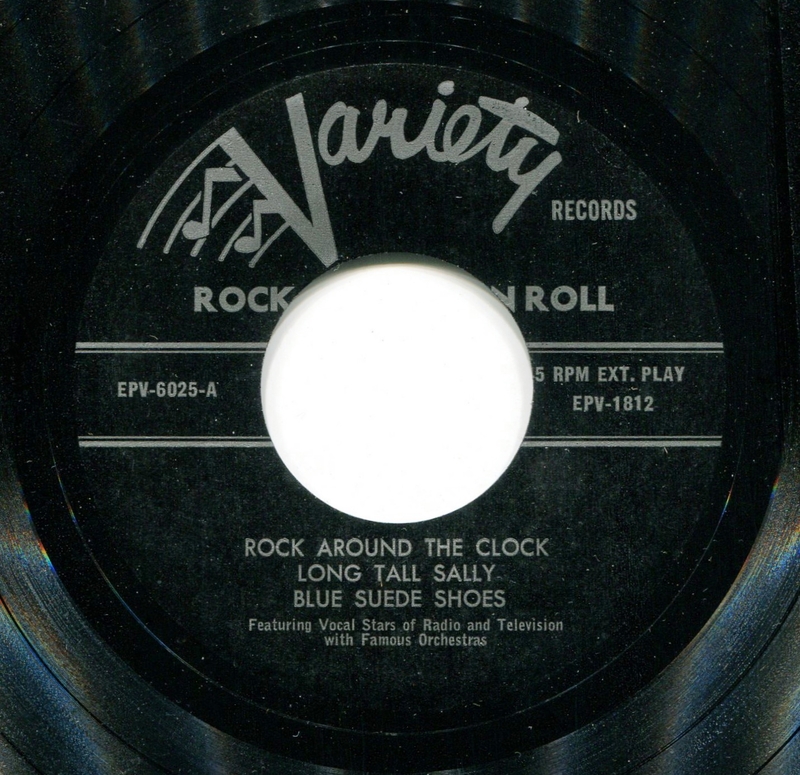 And the version of Rock Around the Clock is my all-time favorite cheap-label version, despite the off-the-beat intro. It found its way around the cheapo labels and may have originated on Gateway. (Update: Nope, not the same version as Gateway Top Tune. It's Gabe Drake on Prom 1118, poss. 1955) Why it was included, I don't know, because the rest of the tracks are copies of 1956 hits, whereas RATC hit it big in 1955 (as a re-release). But I don't complain--it's the perfect starter track. "Reg. $16.00 value." They wish. 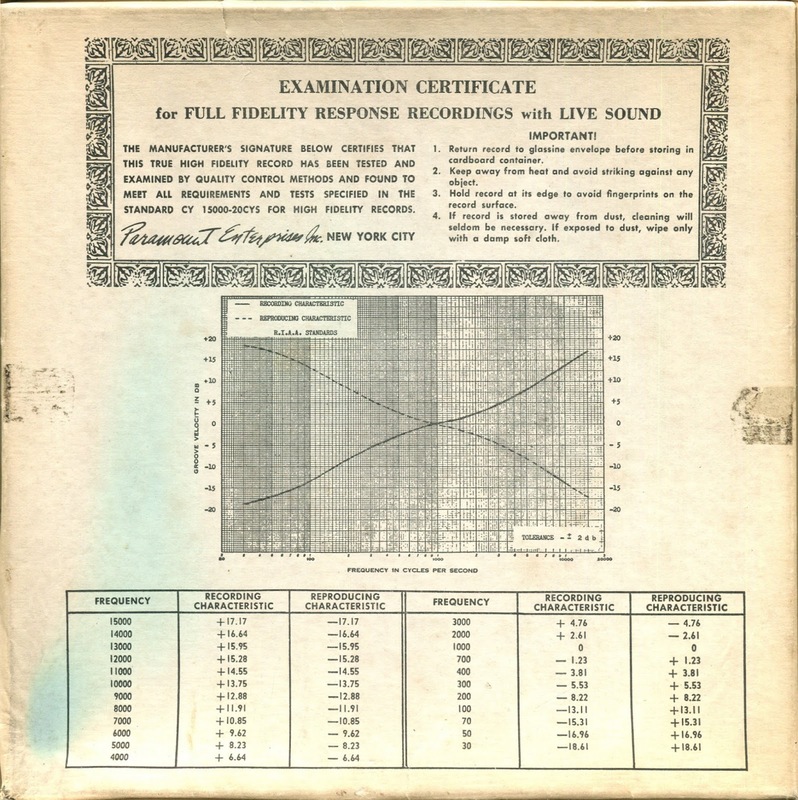 Above: label scan. Suddenly, the set's name is "Rock n Roll," with half of the "n" missing. Such loving care these guys took. The twelve days of Christmas end today, and I wish our Christmas weather would end with it, but no such luck. Below-zero chill factors, a few inches of snow, and 0 degree overnight highs here in the country (must remember to keep small trickle of water running), and nothing fit for humans until our Sunday high of 28. But there are others getting it a lot worse, so I can't complain. I will, anyway. 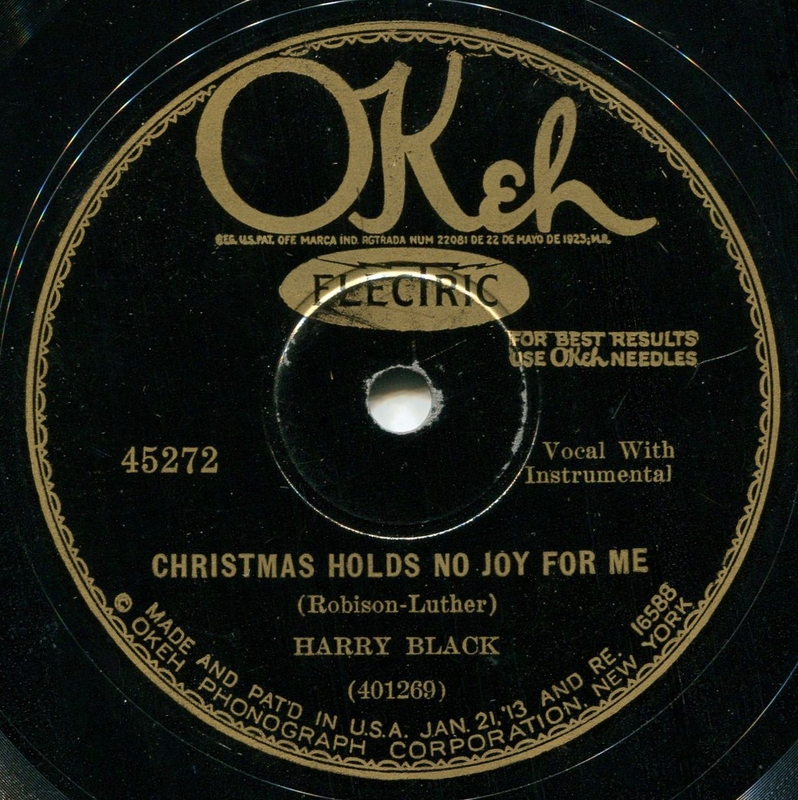 I think I'm justified in calling this single "obscure." 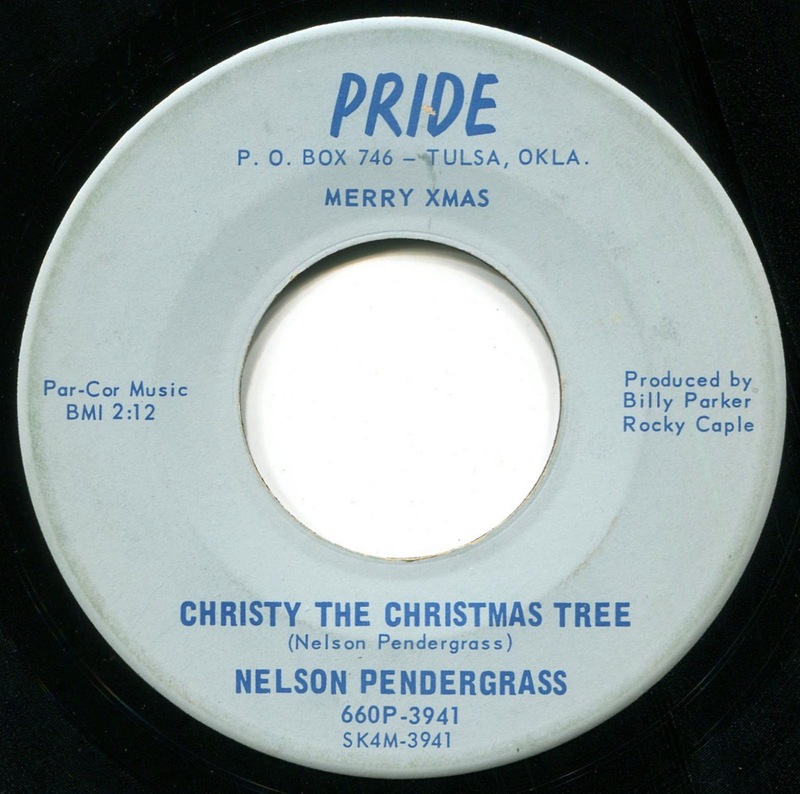 "Nelson Pendergrass" + "Christy the Christmas Tree" gets a single Google match--a discography (minus dates) of Oklahoma record labels, including this one (Pride). It appears that Pendergrass did one other Pride single--“Cute Little Checker Girl/Tomorrow Is Her Birthday." Now you know all I know. About this topic, I mean. Pleasant sides, sounding very much like small local label efforts (why would that be, I wonder? ), and destined not to become internet classics. But they make for a nice and quiet farewell to Christmas 2017, even if the weather ain't following suit. 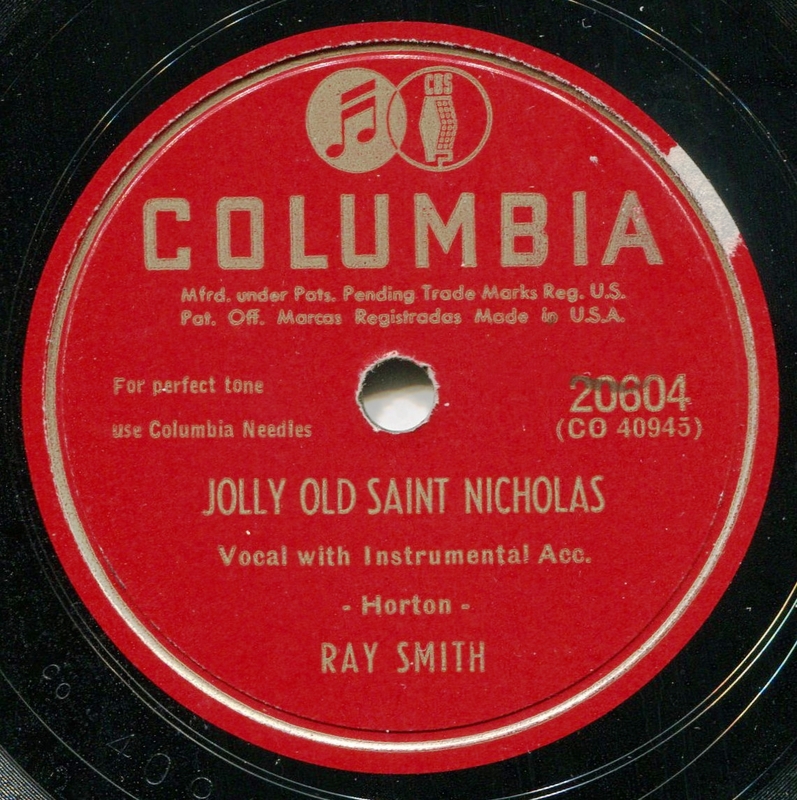 The eleventh day of Christmas is here, and we celebrate it with a good ol' 1949 country rendition (by Ray Smith) of Jolly Old Saint Nicholas, here credited to "Horton," though Wikipedia tells us the lyrics of this 19th century classic have been attributed to Benjamin Hanby, and the music to John Piersol McCaskey. But Jolly Old was public domain by 1949, and all kinds of false credits end up getting stuck on p.d. creations, so we'll pretend "Horton" wrote it. Which Horton, though? Vaughan Horton? Johnny Horton? I need to know. I must know. I DEMAND TO KNOW!!!! Sorry--too much caffeine this early in the morning. Oh, wait--Billboard to the rescue. An Old Christmas Card was written by Vaughan Horton, and maybe someone at Columbia figured he or she may as well credit the flip to Horton, as well. Or, more likely, Vaughan Horton arranged the flip side. P.D. stuff is often credited to the person who arranged a particular version of it. 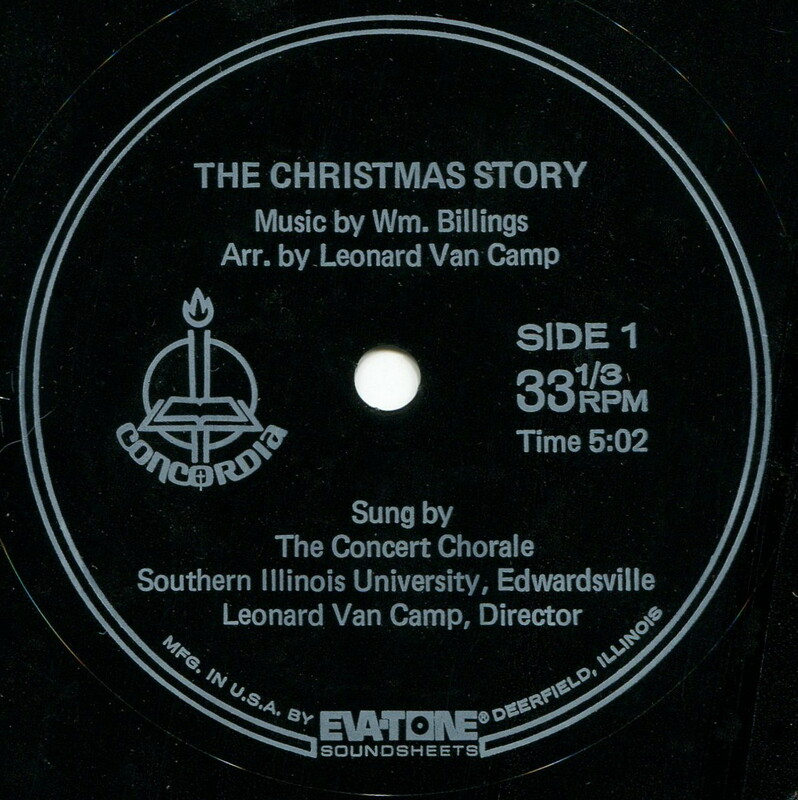 Another flexi disc Christmas selection for our holiday period, The Christmas Story, with music by the great William Billings, arranged by Leonard Van Camp (1934-2003). Maybe the best selection I've put up for 2017, the quality of music and performance is astonishing, and the Eva-Tone Soundsheet yields uncharacteristically good sound when reduced to mono. Forgive the moments of double-tracking (or whatever the correct term is)--i.e., a kind of groove bleed-through, which I've read is the sign of a very good, sensitive stylus. Maybe I should have used my cheaper Stanton stereo needle for this cartridge for less bleed-through. No date on the disc, but the choral music for this was printed in 1974, so we can figure (i.e., guess) the disc is from the same period. On line, I see no reference to a regular LP issue of this performance, which seems weird, again in part because of the sheer quality of performance and recording. Anyway, a gem for our tenth day of Christmas. The Christmas Story--Music by Wm. Billings--Arr. 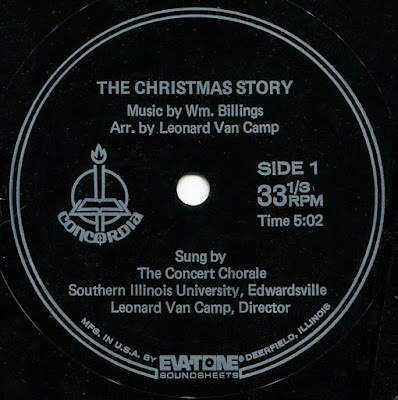 by Leonard Van Camp The Concert Chorale, Southern Illinois University, Edwardsville, Leonard Van Camp, Director. Please don't be misled--I do want you to have a joyful ninth day of Christmas. I want everyone to. 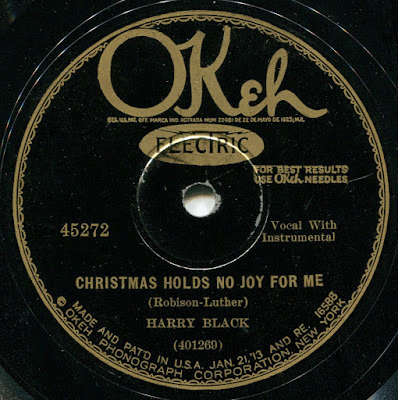 Harry Black, however, harbors terrible memories of the holiday--memories that sound like something out of a sad 1928 country song. 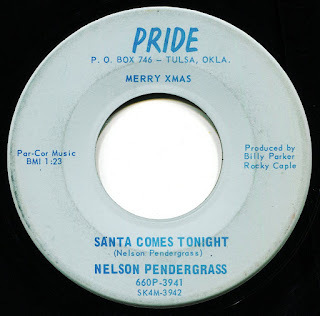 By no coincidence, this is a sad 1928 country song, concocted by Carson Robison and Frank Luther. Thanks a lot, Carson and Frank. The flip side, Jesus the Light of the World, is much cheerier, if that helps. Far more conventional Christmas fare, too. Welcome to the eighth day of Christmas (also known as New Year's Day)! Today, a 1950 single by Art Mooney and His Orch., featuring Laura Leslie on lead vocal. 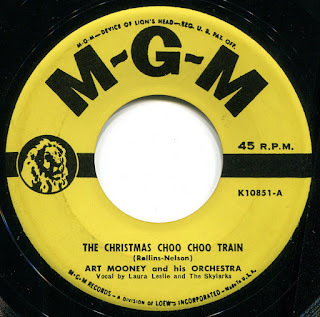 Charming sides, beautifully done, though I have no idea why the writers of Choo Choo Train inserted the quotation from The Girl I Left Behind Me in the melody. Weird.